I started my morning with this amazing group of third, fourth and fifth graders at Southside Elementary School in Siloam Springs. 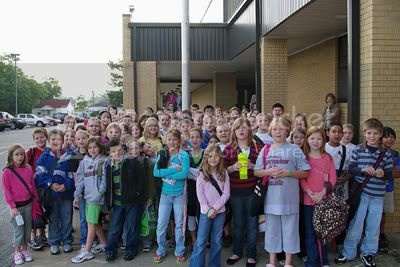 The students (you can't see them all....) took part in the See You At The Pole observance at their school. This is the third year students at First UMC - Siloam Springs have helped to organize the student-driven prayer event. 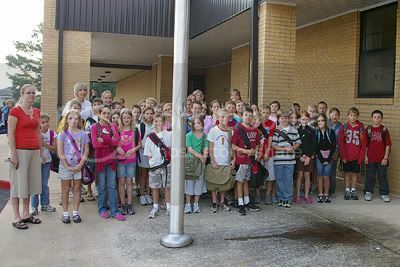 Typically, middle school and high school students are the ones who participate in SYATP, but three years ago, I asked the 3rd, 4th & 5th graders in Timothy Team, if they wanted to try it at their school. For the last three years, all I've done is make a phone call to the assistant principal to let her know that the date is coming up, and make posters and postcard flyers for the students to hand out. It's up to them to "spread" the word among their classmates. 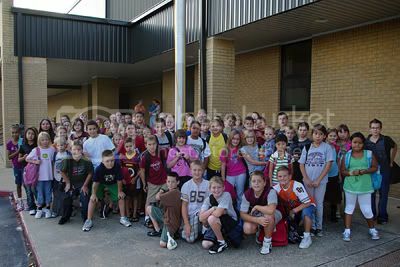 Each year, the group has gotten bigger and bigger. Some years, students feel comfortable and pray outloud, other years, students just pray to themselves.. I get goosebumps when I see the number of kids who turned out for the event. 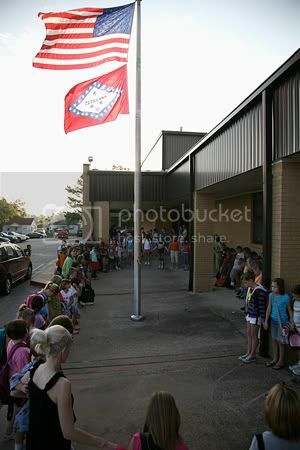 Photo by Melissa Gute, Siloam Springs Herald Leader. This is a great example of students living out 1 Timothy 4:12 - (The Timothy Team key verse): Don't let anyone look down on you because you are young, but set an example for the believers in speech, in life, in love, in faith and in purity. I'm so glad that I'm in a place where students feel comfortable to be an example to others. (Without putting negative pressure on others to do the same). Here's a flash back to past SYATP's. (Obviously, the group is growing, even as the students "age" out and go on to middle and high school.